Proetiosum aurum nigrum means "precious black gold," referring to the meaning of ouro preto, "black gold". The name Ouro Preto dates from 1698, when gold was found in Minas Gerais (which, by the way, means "General Mines"). The name "black" comes from the color of the gold nuggets. Details are at http://www.ufop.br/OuroPreto/sobreop.htm. Ouro Preto is one of the oldest settlements in Brazil, featuring a very well preserved urban center, embellished by the stone-works of the famous sculptor Aleijadinho ("little cripple"), in an interesting early phase of the Brazilian mixture of Portuguese and local elements. The official website is at http://www.pmop.com.br/index/index.php. This is the flag (first flag from bottom to top: http://1.bp.blogspot.com/_hU0MHGue0PA/TRaAutAyd4I/AAAAAAAACtU/924J8LxYtjg/s1600/IMG_7957.JPG , source: http://drewrtw.blogspot.com.co/2010/12/ouro-preto-brasil.html) of the Associaçao Empresarial e Comercial de Ouro Preto (Business and Commercial Association of Ouro Preto). The flag is the logo over a white horizontal flag, with the name below, in Portuguese. 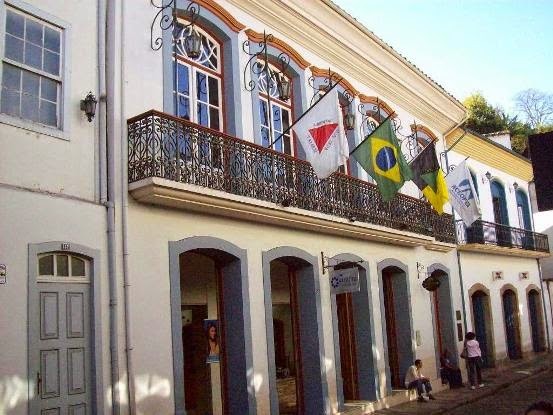 It was established on January 28, 1934 (Source: http://www.aceop.com.br/sobre-nos). Here's another picture (fourth flag from left to right): http://4.bp.blogspot.com (source: http://historiasylvio.blogspot.com.co/2015/11/historia-de-ouro.html).